The Breckwell P22 is the 'budget' model in the Breckwell range. That being said, It has all the facilities of the more expensive stoves. The P22 provides 40,000 btu. and a burn time of up to 45 hours from the standard hopper. A hopper extension allows a capacity of 110 lbs. increasing the potential burn time to 110 hours. 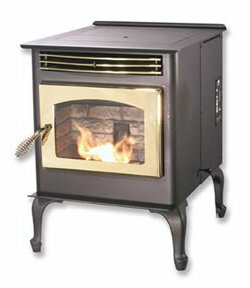 This stove is supplied as the basic insert unit. You decide whether to specify a pedestal base or the leg option. The legs come in either nickel or black. The P22 has a large ash capacity for a stove of this size, it is recommended to be emptied only after burning a ton of fuel. See comments below. Weight 185 lbs. Pedestal + 40 lbs. Legs + 13 lbs. Window Size 12 in. by 8 in. Rear Vent Height Freestanding 11 in. Insert 2.5 in. Hopper extension to increase capacity to 110 lbs. (Freestanding only). 30 in. by 39 in. It's recommended that the Breckwell P22 not be run for more than an hour at a time on the high heat setting to prevent damage. The hopper extension, while being a useful addition, does not improve the looks of the stove. The P22 does not have an ash pan. Ashes must be scraped into a suitable non combustible receptacle. 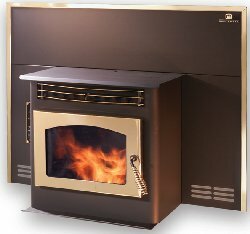 If you would like to leave a review of the Breckwell P22 pellet stove or fireplace insert, please use the form on the contact page.